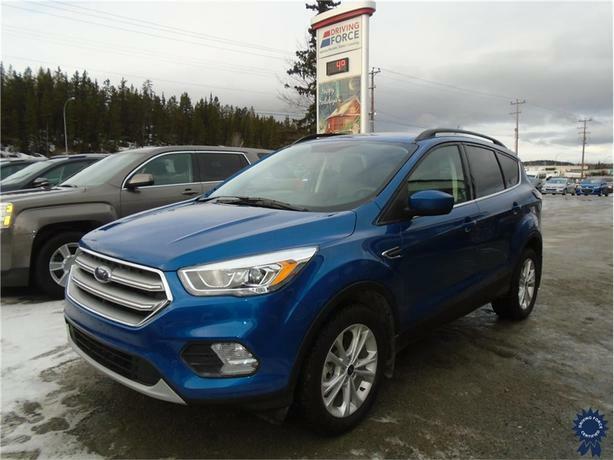 This 2017 Ford Escape 5 Passenger 4X4 SUV comes with a 6-speed automatic transmission with SelectShift, 3.51 axle ratio, 17-inch sparkle-painted aluminum wheels, lightning blue exterior color, heated cloth front charcoal-color bucket seats, all-weather floor mats, cargo area protector, remote vehicle starter system, engine block heater, front fog lamps, three 12V DC power outlets, cruise control with steering wheel controls, dual zone front automatic air-conditioning, carpet floor trim, SYNC Communications and Entertainment System with enhanced voice recognition, 911 Assist, 4.2-inch LCD display in centre stack, AppLink, and 1 smart charging USB port, low tire pressure warning system, backup camera, and GVWR rating of 4,760 lbs (2,159 kgs). The 1.5-litre Ecoboost GTDI Sigma gas engine provides 179 horsepower at 6,000 RPM and 177 lb-ft of torque at 2,500 RPM. Touch base with us to discuss purchasing or financing options that are right for you and experience the difference you will only find at DRIVING FORCE Vehicle Rentals, Sales and Leasing.